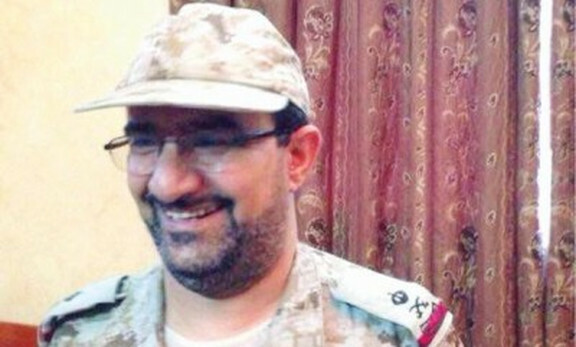 Major General Abdul Rahman Al-Shahrani, commander of 18th Infantry Brigade of Saudi Arabian Army reportedly KIA with members of RSLF on 23AUG15 by elements of Yemeni Army in Jizan province, southern Saudi Arabia. Royal Saudi Land Force M2A2 Bradley infantry fighting vehicle (IFV) and armored wheel loader, knocked out and abandoned at Jizan region, southern Saudi Arabia. 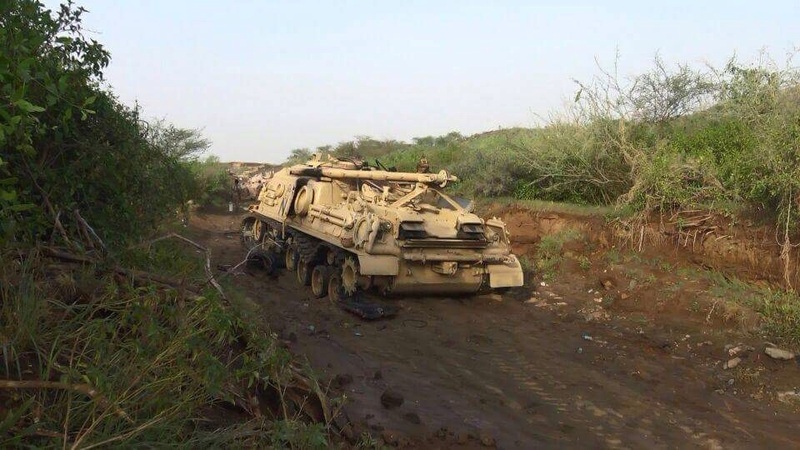 Royal Saudi Land Force M88A1 Recovery Vehicle (ARV), disabled and abandoned at Jizan region, southern Saudi Arabia. 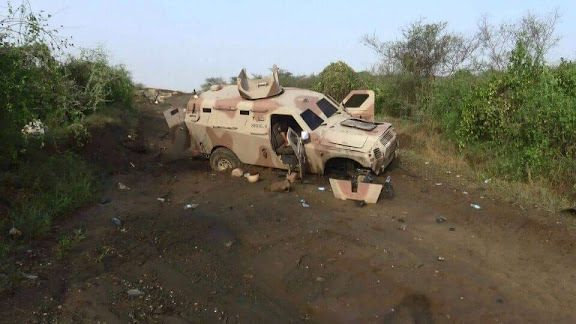 Royal Saudi Land Force Al Shibl 2 (“Cub 2”) armored vehicle, knocked out and abandoned at Jizan region, southern Saudi Arabia. 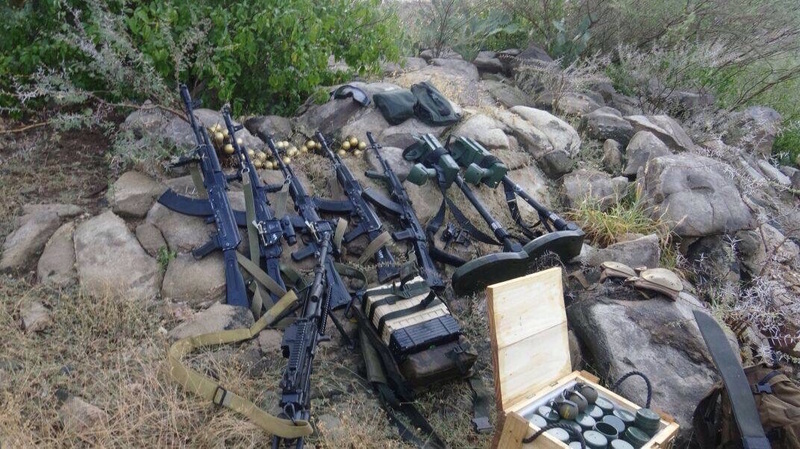 Small arms and equipment, thrown down by fleeing Royal Saudi Land Force troops at Jizan region, southern Saudi Arabia. Royal Saudi Land Force M2A2 Bradley infantry fighting vehicle (IFV) and unidentified fighting vehicle, knocked out and abandoned at Jizan region, southern Saudi Arabia.. 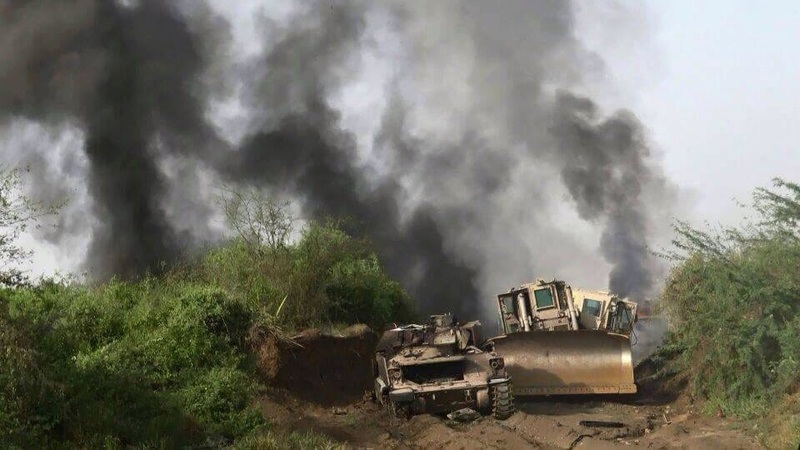 Doomed Saudi AH-64 Apache attack helicopter, shot down by Ansarullah forces in the district of Harad, in the western Yemeni province of Hajjah. 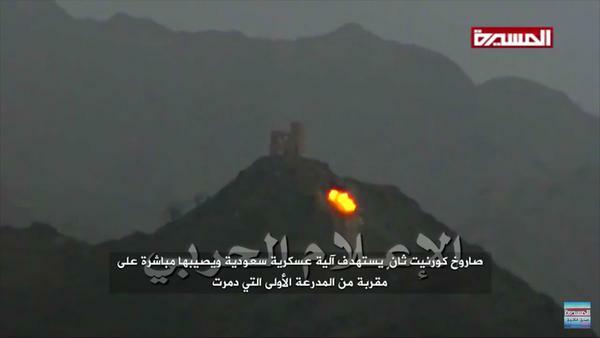 Royal Saudi Land Force AFVs being targeted by Ansarullah forces operating Kornet ATGM, at Jizan region, southern Saudi Arabia. 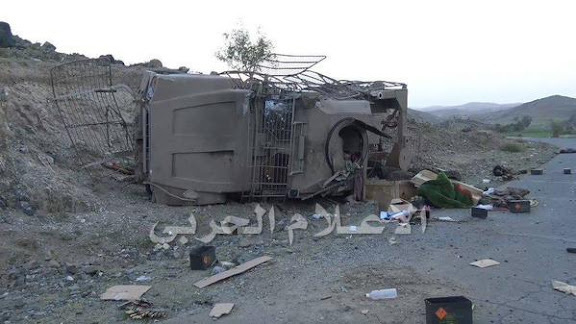 Knocked out United Arab Emirates Army Oshkosh M-ATV Mine Resistant Ambush Protected (MRAP) vehicle, location: Mukayras, in southern Yemen. 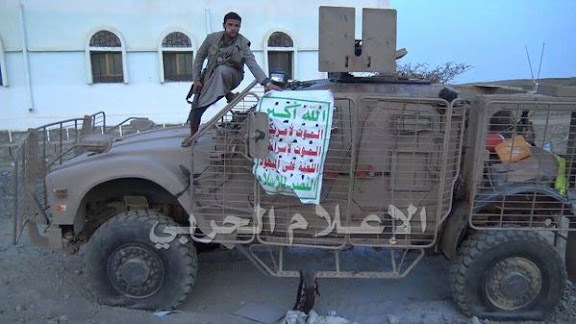 Abandoned United Arab Emirates Army Oshkosh M-ATV Mine Resistant Ambush Protected (MRAP) vehicle, location: Mukayras, in southern Yemen. Ansarullah or allied force member. Note the Republic of Yemen tricolor. 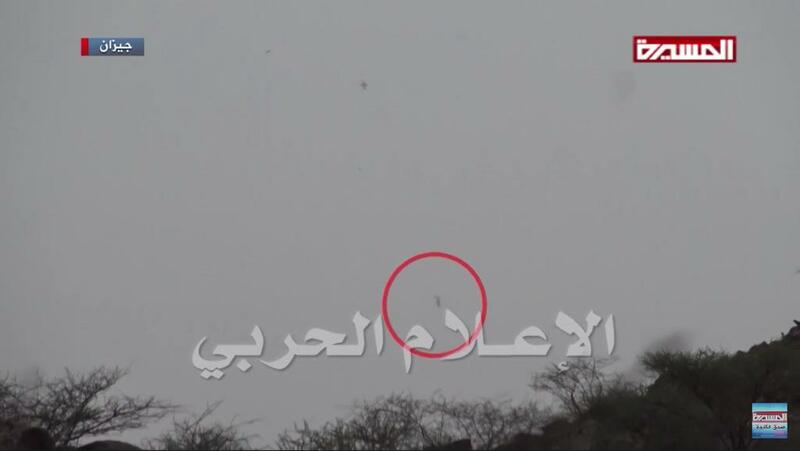 The primary local force of the Saudi/UAE led coalition fly the flag of South Yemen, not the flag of the Republic of Yemen. 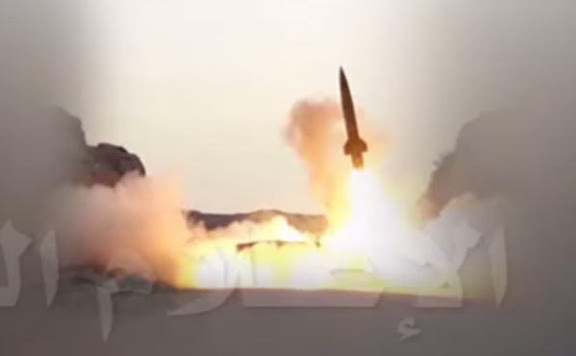 Ansarullah/Yemeni Army forces may be yielding to vastly superior firepower of Saudi/UAE forces, but they do not appear to be a beaten force. Rather, they appear to be reverting to tactics that include ambush and road mines. How long this conflict continues may very well determine the ultimate measure of success or failure for this Saudi/UAE effort. 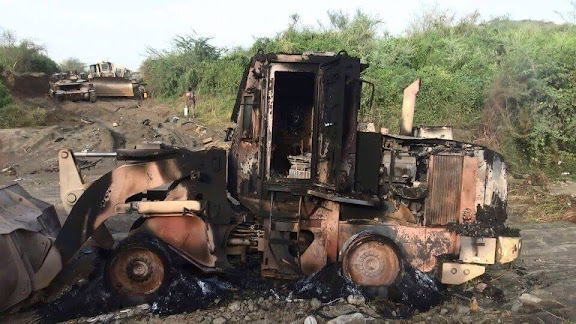 Mark, Fourteen destroyed military vehicles, and their photos, are more significant for information operations than military operations. And that’s probably why that in more than four years of civil war in Syria, you have not posted reports/photos of destroyed military vehicles. Drama aside, the Yemeni conflict could develop into a stalemate and/or division of the country. Syria is also a good example here. Sooner the Houthi/Saleh side and the government-in-exile could agree on a political solution, better off would be the country. Like some of the grown-ups with military experience had posted earlier, much to the chagrin of the anti-Shia commentators, the Zaidis are some of the toughest fighters of earth and even make the legendary Hezbollah look quite tame. Saudis in their ignorance, arrogance and hubris have committed the mother of all follies and will pay a heavy price. The Egyptians who were far superior fighters than Saudi mercenaries lost 30,000 dead in Yemen in the 60's despite using chemical weapons. 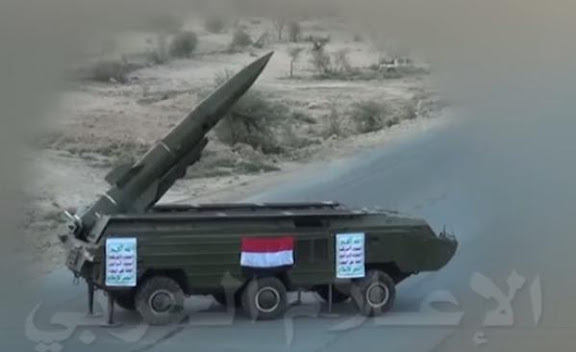 The Ansarollah are just getting warmed up with new Kornet and SA-16 manpads and will take the war into Najran, Saada, Asir and Jizan which the Yemenis have historical claims to. Yemen is over half a million sq kms of wild terrain with over 42 million people and about 52% Shia, the Saudis have stirred a real hornets nest with born warriors, who in the tradition of mountain people like Chechens and Afghans, don't cotton to foreigners killing their kids and bombing their homes. 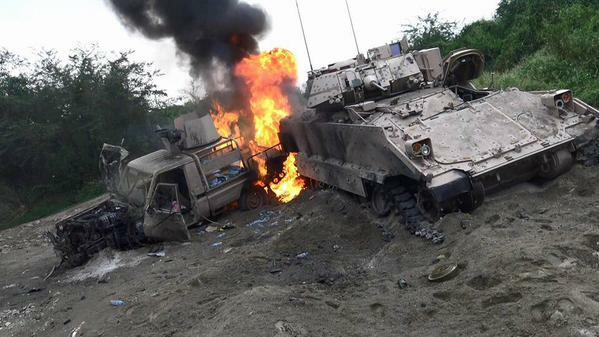 This is a long fight and will end up miserably for the Saudis and their naive bombast. 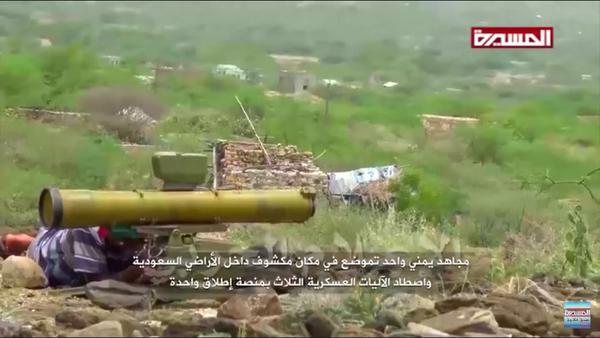 Picture 9 is not a Kornet ATGM, but 9M113 Konkurs. It's precisely this type of sloganeering that the region does not need. 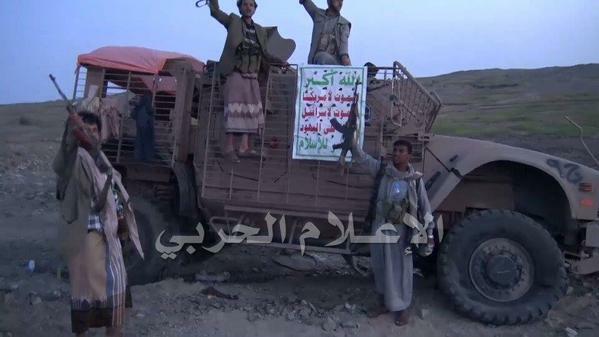 The Houthis decided to partner with Sahih to take over the entire country by force. They took Sanaa with no problem, but made a serious mistake of rushing south to capture Aden, spreading their forces too thin, and now have all but lost the south and their dream of leading a national government in the country (they probably should have waited for the elections to reach that goal through the ballot box). Now they need to resort to irregular fighting and might end up losing Sanaa as well. The sooner the two sides come to negotiating table and form a truly national unity government, the better would be the chances of keeping Yemen unified and stop further destruction of the country.